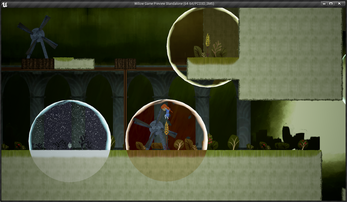 This blog post is posted as a part of the Hurdles series of work and tell game development. To find out more about Hurdles, please check out our handy FAQ. This blog post was provided by Kevin Overall for his game Willow as well as his Ludum Dare 36 game, No Man Has Gone Before. Hey RJD folks. I’m Kevin Overall, and I just made my run through Hurdles working on Willow. Willow is (well, *was*. I’ll get to that later) a puzzle-platformer in which you navigate a celtic fairy land by manipulating the seasons. A prototype had previously been developed in Unreal Engine, and the goal for Hurdles was to finish off porting the prototype to Unity. The process went fairly smoothly, with the exception of one week. That one week, I actually spent all of my personal dev time working on a game for Ludum Dare 36. So I actually sort of presented two games through Hurdles! I would say the most important thing with Hurdles is getting into the habit of making things. Anything at all. Yeah, I didn’t stick to the plan every week, but the fact that I presented something new every time made it work. When you sit down and watch TV, just ask yourself if you could be making things instead, even if it’s not exactly the Hurdles plan. As for the future of Willow, it unfortunately had to be canned less than a week after Hurdles. 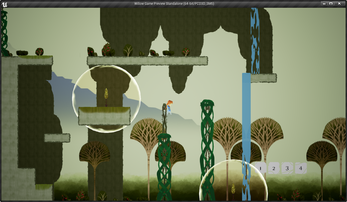 The game Seasons After Fall was released, and it is almost identical to what we had planned for Willow. However, this does show the benefit of working on other things from time to time. We’re now going to be expanding on my Ludum Dare game. We’ll see, maybe it will be the topic of a future Hurdle!